Natural refrigerants are the alternatives for the environmentally harmful HCFC and HFC refrigerants. Natural refrigerants are called ‘natural’ as the chemicals are derived from the natural bio-chemical process itself. These refrigerants have very low impact on the environment in terms of ozone depletion and global warming. The natural refrigerants market size is projected to be USD 1,419.19 Million by 2020 from USD 821.74 Million in 2015, at a CAGR of 11.5%. The market is projected to grow on account of the enforcement of stringent environmental regulations and due to the need to improve the energy efficiency of refrigeration systems. Expansion in terms of production capacity and distribution network is the main area of focus for the players in the market. Major initiatives are also aimed at developing new variants of natural refrigerants with better performance qualities and increased functionality. All these developments are a reaction to phasing out of HCFC and HFC refrigerants that in turn, is accelerating the demand for natural refrigerants. This report includes estimates for the market size in 2015 and provides projections for the market till 2020. The projections and forecasts involve the analysis of various past and present trends in the market that have a potential impact on the market’s future. It also includes a detailed qualitative and quantitative analysis of the natural refrigerants market on the basis of its types, applications, and regions. Various secondary sources, such as directories, annual reports, white papers, and databases have been used to identify and collect information that is useful for this extensive commercial study. The primary sources for the report included experts from related industries and suppliers who have been interviewed to obtain and verify critical information as well as to assess the future prospects of the market. Competitive scenarios of the top players in the market have been discussed in detail. The leading players of this industry with their recent developments and other strategic industry activities are profiled. These top companies The Linde Group (Germany), Airgas Inc. (U.S.), A-Gas international (U.K.), Puyang Zhongwei Fine Chemical Co. Ltd. (China), Sinochem (China), Engas Australasia (Australia), Tazzetti S.p.A (Italy), and Shangdong Yueon Chemical Co. Ltd. (China), among others. This research report categorizes the global natural refrigerants market on the basis of type, application and region in terms of market size and analyzing trends in each of the sub markets. On the basis of type: The market is segmented by type of natural refrigerants – Ammonia (R-717), hydrocarbons (R-290, R-1270, R-600a), and carbon dioxide (CO2) (R-744). Each of these types has been further described in detail in the report with market size forecasts as well. On the basis of application: The market is segmented by the applications of natural refrigerants – Industrial refrigeration, commercial refrigeration, domestic refrigeration, stationary air-conditioning and mobile air-conditioning among others. All of the applications have been further described in detail in the report with market size forecasts. On the basis of region: Europe, North America, Asia-Pacific, South America, and the Middle East & Africa; for key countries within these regions. The natural refrigerants market is projected to be worth USD 1,419.19 Million in 2020 from USD 821.74 Million in 2015, at a CAGR of 11.5% between 2015 and 2020. This is on account of the various regulations that limit the usage of HFC and promote natural refrigerants. Increasing demand from refrigeration and air-conditioning (RAC) sector are also driving the growth for the market. They are used in various applications for refrigeration: industrial, commercial and domestic; and air-conditioning: stationary and mobile among other applications such as in chillers and heat pumps. Europe is the largest market majorly driven due to environmental concerns and emission regulations. Asia-Pacific ranks second in terms of market size which is followed by North America. 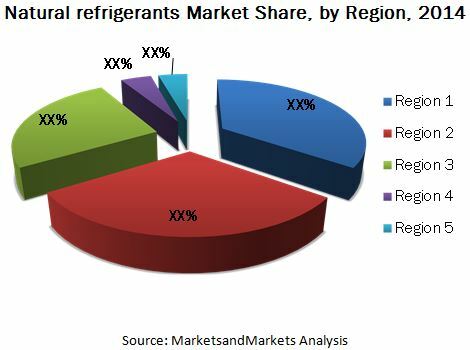 The manufacturers in the natural refrigerants market are looking to expand their distribution network to take advantage of the enforcement of regulations that have been estimated to increase the demand for natural refrigerants. Companies have used merger & acquisition strategy to expand their presence as well as to increase their production. The intial high cost of natural refrigerant based system, lack of technical knowledge for handling of natural refrigerants, and the related flammability and toxicity issues of the refrigerants are the major restraints for the market that have to be dealt with. The major players in the natural refrigerants market are Linde Group (Germany), Airgas Inc. (the U.S.), A-Gas International (the U.K.), Sinochem (China), Puyang Zongwei Fine Chemical Co. Ltd. (China), and Shangdong Yueon Chemical Co. Ltd. (China) among others. The market also has a high presence of small to medium manufacturers that cater to smaller parts of the end-use industries. The competition in this market was low due to low volume demand and focus on different regions. The enforcement of environmental regulations will be increasing the competition between the companies in the coming years. Expansion in terms of production capacity and region is the preferred strategy adopted by the major players. The companies are also focusing on developing new products with better performance to increase their share in the natural refrigerants market. 10.8 Puyang Zhongwei Fine Chemical Co. Ltd.
10.9 Shandong Yueon Chemical Industry Ltd.
10.11 Hychill Australia Pvt. Ltd. Figure 65 SWOT Analysis: Airgas Inc.